One of the best online banks in Germany, ComDirect offers a free bank account with free VISA card and free worldwide cash withdrawal. In addition, for new customers, the bank gives a joining bonus of €150 . For more information about ComDirect checking account, click here. Below is a step by step instruction guide to open a Comdirect current account online with English translation and detailed screenshots. Open the online application form from the link provided here (opens in a new window). This will open the below page. 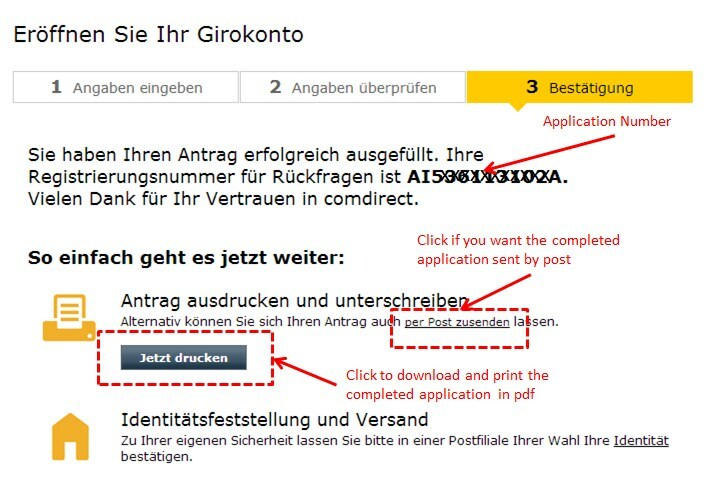 Click on the button “Jetzt Girokonto eröffnen” highlighted below. Provide information about the bank account you need. You need to mention if you need a personal bank account for private use or a business account. Next, provide you need to open a single account holder or a joint account. Provide your personal details such as name, date of birth, Nationality etc as seen below. Provide your Registered address in Germany (Switzerland or Austria). You you reside in other countries, you cannot open the account online. In case you have not resided in the present address for more than 2 years, you will have to provide your previous address also. Please provide details about your employment. Angestellte/r (Employee), Selbständige/r (Self Employed), Hausfrau/mann (Housewife/ Stay-at-home Dad) or Studente/n (student) are the mainly used. If you do not belong to the above, check google translate. Select the free credit card you need, for this, you need to provide your monthly salary based on which your credit limit will be set. Small change saving (literally translated) is a option which you can select to open a saving account. The saving account is usually higher interest earning. How does this work? When you use your card, the payment is rounded off to the nearest euro and the extra change is directly deposited into your saving account. This allows mandatory savings without you realizing it. If you want to activate this feature click on the check box. This allows you to take a withdrawal from your bank even if you do not have enough balance left in your account. Overdraft incurs higher interest charges which will be incurred each month. 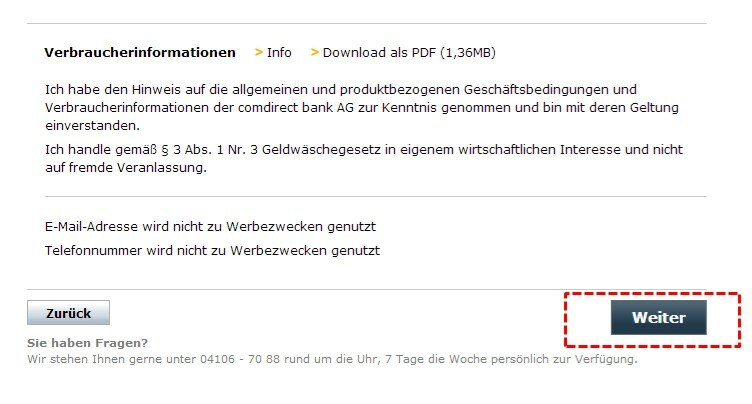 If you are new to Germany and do not have a good credit rating, avoid this while applying for a bank account. If you request for a overdraft facility without a good credit rating, your bank account will be rejected. You can apply for a securities deposit account if you are interested in buying shares or funds or other securities transaction. This is a free account so you do not have any obligation to use it even if you open it. If you are new to trading then you can ignore it, but sometimes it helps to also apply for this free securities trading account since banks usually give higher preference to customers (lower chances of refusal) who opening a bank accounts which also include a securities trading account. 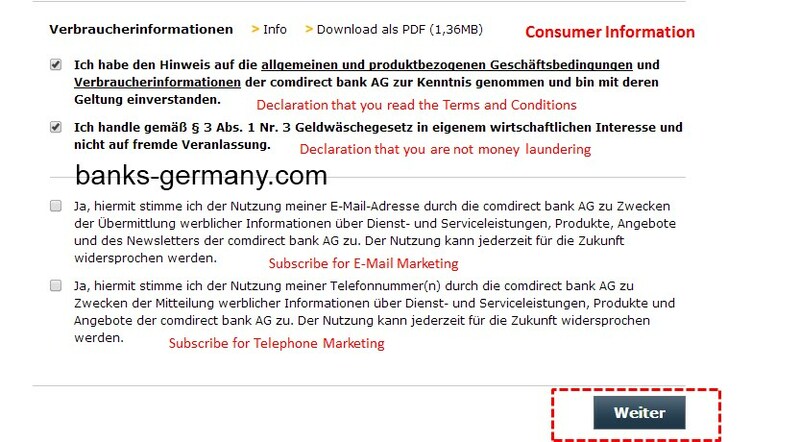 Check the appropriate boxes declaring that you read the terms and conditions and that you will not use the account for money laundering purposes. You are also provided with opt-ins to subscribe for Email marketing or telephone marketing. Click on Weiter (Next) to continue. If you need to make any corrections, click on the highlighted portion as shown above in the appropriate places and correct the details. Once corrected, select Änderung speichern to save the corrections. You can download the terms and conditions as PDF for your reference as seen below. Once you have confirmed the application, click on Weiter (Next) to continue and submit the application. Sign the application form in front of the Clerk at Postoffice. He will check the details on the application form with the details on the details on your passport and verify the signature. Then the clerk at the postoffice will send the application form to the required address free of charge. This is a new verification method provided by Comdirect where you can confirm your identity through video telephony. However, it is currently only available for holders of identity documents which is in German. That is passports from German speaking countries (Germany, Austria, Switzerland, Liechtenstein and Luxembourg). Firstly, thank you for this awesome resource. It was an incredible help when comparing and applying for an account today, fingers crossed my application is approved! Hi SJ, Thank you for your comment. If you noticed, the postal code in the previous address is not a mandatory field. So I suppose it can be ignored if your previous address was outside Germany, Austria or Switzerland. I called them up and they told me they are aware of the issue. Simply enter that you have been at this address for 2 years (even though it’s not true), and when you print out the form, change it by hand and enter your previous address. I applied for COMDIRECT visa card and checked “Overdraft Facility”. The requested amount has been approved by the bank along with interest rate which will be deducted as per your explanation. Now, the doubt i have is, if i do not use this credit amount, then also, do i have to pay the interest ? The overdraft is for the bank account, the Visa Credit card comes free with the bank account. The interest will only be used if you go into the negative (i.e, use the overdraft). The overdraft is the amount how much your account is allowed to go into the negative. That is, if your account does not have any money, you can still use the account till a certain limit. So if you have an overdraft limit of €500 approved, you can make payments till you account goes to a balance -€500. Only when it goes to the negetive, the interest is charged on the amount you overused. This is useful if you are living paycheck to paycheck, so that even if there is a delay in your paycheck, your standing orders for rent or telephone payment does not get refused by the bank for not having enough balance. Although it is useful, it is recommended not to use it, or even apply for it, unless you think it is necessary. It will affect your credit score since it is like an open option to take a loan at anytime. But don’t worry if you have already got it approved, just do not use it so your score will not be affected. Hi, just applied for this account. Quick question, I didn’t check the free visa card, being that I don’t want a credit card, just an atm card. Will I stil receive this or should I have added the Kostenlose Visa Karte? *Will I still receive an atm card? Yes, an ATM card called “Girocard” with the V-Pay function always comes free with the account. So you will receive it. The Visa card is an additional feature, so you will have to apply for it. FYI : Since it has V-Pay, it is similar to an EC-Card which will let you use it for purchases at shops in Germany. The free Girocard can also be used at all ATMs of Cashgroup (i.e. Commerzbank, Deutsche Bank, HypoVereinsbank and Postbank). But unlike the VISA card, you cannot use it in other ATM’s. I ‘ve applied for German Visa week ago. It will be ready on 09.10.2015. I have a right to be in Germany legally with Polish residence permit card. So, is it possible to present Polish residence permit card during registration of bank account? Otherwise, I do not have so much time to wait for all such things, as bank account and so on. Since postIdent happens at the postoffice clerks and not by bank employees, they can vary at times. Sometimes, they ask for nothing other than your passport. Sometimes they ask for more documents. If they do, then also show your Polish Residence permit (Schengen Visa). Also, a letter from the Auslanderbüro which says your Visa will be ready by 9.10 is also a good document to show them. Good luck. My situation is this: I already have an opened account with Commerzbank. I realised that I don’t need the ‘brick&mortar’ situation anymore AND I certainly don’t want to pay those monthly fees anymore!!!! (Horrible!!). Therefore, I want t proceed with this new Internet banking system. Do you know if there a co-relation among both Commerzbank and Comdirect in that could present a problem while making the switch? Or maybe they are in practise two complete independent entities of each other? Also, what would be the best way to transfer the funds? Hi Martin. There would be no problem in making the switch to Comdirect and they are two different entities for all legal purposes. They do share some services, such as cash deposit. You can deposit cash in any of the Commerzbank cash machines into your Comdirect account, but that is only advantageous for you. 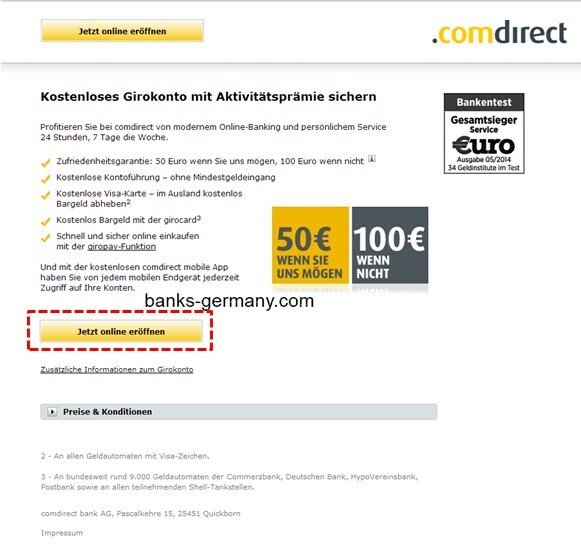 Although Commerzbank is recommended, since you do find the need for a branch, you can switch to ComDirect to save on the fees. BTW, there should be no fees if you deposit more than €1200 in Commerzbank. Just complete the application for ComDirect as stated in the article. 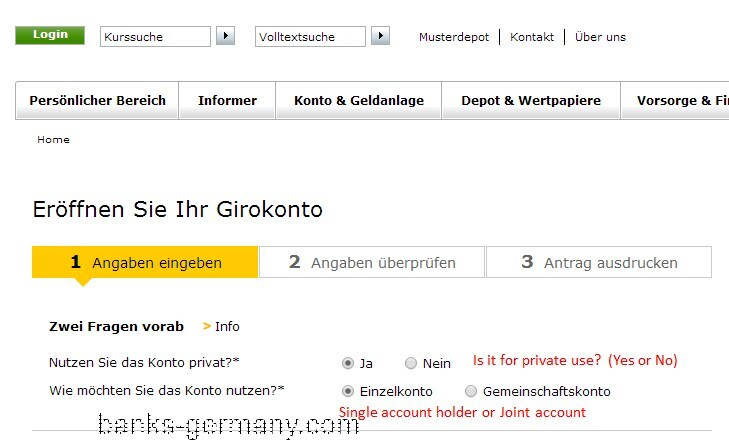 Once you have opened the new account, you can use the “Kontowechselservice” (Account transfer service) of Comdirect to also change the standing orders to the new account. 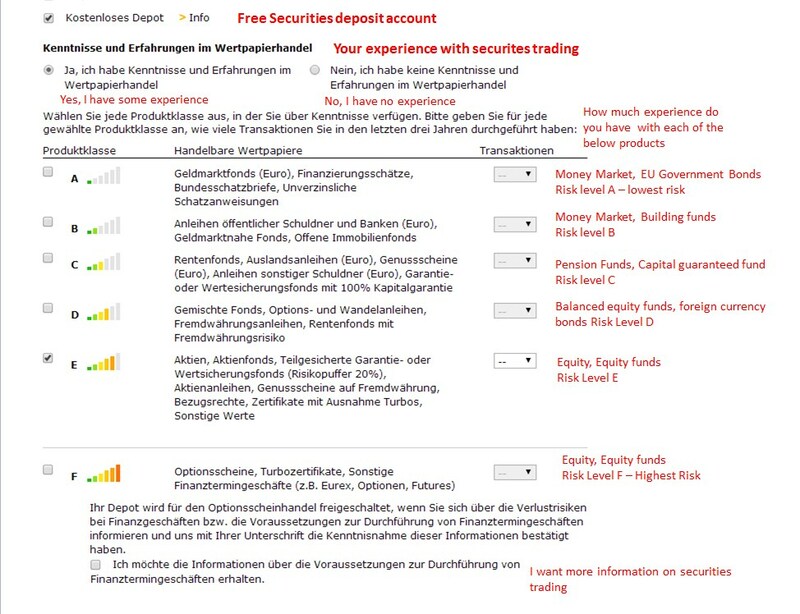 Best way to transfer funds from the old Commerzbank account to new Comdirect account is the normal SEPA transfer. 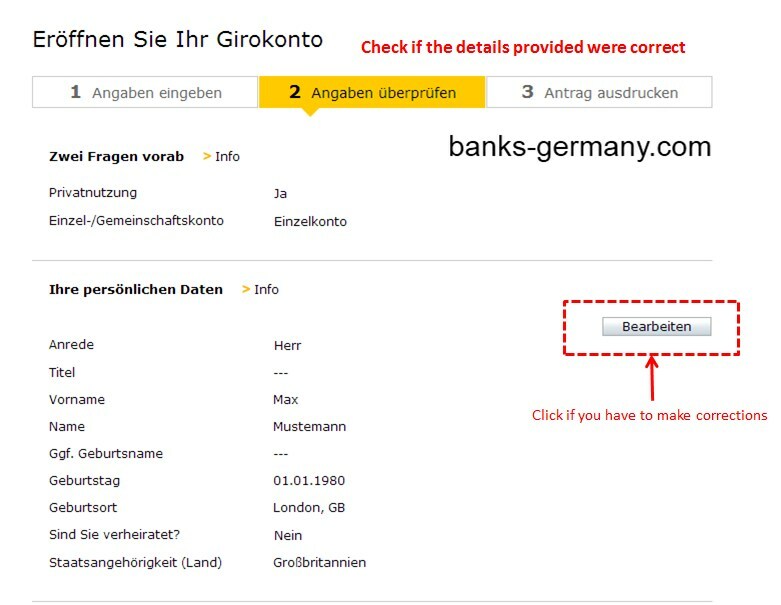 Since both are German bank accounts, as long as you do an internet transfer from your Commerzbank online portal, it should be free of cost. It should sound obvious, but do not close your previous account for a couple of months till everything is sorted out with your new account. Thank you so much for your kind advice. I will open the new account and hold on to the other for a bit more time of safety. (i have to monitor the one monthly extracted Vodafone bill and that’s all). Exactly, I never use the Branch (it’s a thing of the past for me), therefore it is useless to pay over 10€/month because I do not have a fixed input monthly as my income comes in lump sums randomly through the year. (i.e. I could physically take out 1200€ and physically deposit it back into the account every month, but this is tedious to always remember and i am not always in the country for some months out of the year). However, i find the cash machines for notes and coins deposit a HUGE advantage in my case. 1. Will this new account enable me to transfer my existing Vodafone monthly payments (for example)? 2. In the question for how much credit limit for the Visa credit card, would 250€ be sufficient for someone who is Haussmann? or is there a better number to input? Perhaps they will automatically reject the Visa card option altogether or stipulate their own credit limit. 1. Yes, you can transfer any monthly payment to your new account. They also have a service call KontoWechsel where you can do it once you open the account. Otherwise, a simple letter (mandate) to Vodaphone with with details on your new account will do the trick. 2. It depends on your credit score also. In case they do not think it is enough, they might refuse your VISA card, but still open the bank account. So i DID receive my new VISA credit card today even though I submitted the lowest possible value during application. So that was nice! Now just awaiting the EC karte any day now! I re-read the fees definition for the deposits. It’s actual 1,90€ per deposit (and not 1,50€ as I quoted). This is annoying. However, I cannot see to find a better solution. DKB does have 1-2 brick-and-mortars in each East-German city, which suits me, but I don’t know is they include the Münz machine, like they have at Commerzbank. I’ll have to inquire. Hey no problem wth the delay! Thanks for replying. In the meantime, 2 days ago I just received my first few letters (PIN, Tan, welcome pages, etc) regarding successful opening of this .Comdirect account, and waiting for the actual Giro card and eventual VISA card arrive soon. HOWEVER, I just read the welcome pages and noticed something that did not exit when I started my research and this post back in November. Basically, i signed up for this bank because of the idea to use the money deposit machines at Commerzbank (I especially have lots of coins to deposit). Since recently, there has been a new decision to charge a fee of 1.50€ each time you deposit into the account (first 3 deposits are free, up to one cycled year)! In this situation I might be worse than my current situation with Commerzbank standard monthly fees (5.90€). I wonder if there is another bank that could offer such a service without this deposit fee? I’m not sure but i think DBK might have some deposit machines and they DON’T charge you any monthly fees for maintaining a minimum deposit per month either. Hi, yes you are right. Since 2016 comDirect has introduced charges for deposits more than a certain number of times per year. I will do some more research on it, but as far as I know, there are not many options which offer both, free bank account + free unlimited deposits. For example, Number26 is a free bank but allows upto €100 per month free deposit, HypoVereinsbank have coin machine but requires a monthly income of €1200 deposited. B) if my account balance is above 1200 EUR each month? My understanding is that it is (A), but banks in other countries, e.g. in the USA, are happy with (B), so I would like to double-check that. Thank you very much for this — it was bloody helpful for me. I have a quick question: I have to transfer money to my landlord. Can I do this with this ‘Giro’ account? If so, can I do this online (before or after receiving the ATM card)? Yes, a Girokonto is the normal checking account though which you can make any payments or receive money. You do not need the ATM card for that. For online access you will need a Zuzangsnummer (Access Number) and online PIN (a 6 digit pin), both of which you will receive in a week once your account is open. You will then also need TAN numbers, which is also be sent to you in a week. You cannot make payments to your landlord using the Sparkonto (Fixed saving account) or the Tagesgeldkonto (Daily Saving account). Ok buddy, thanks a lot for your help! Is it that normal that they take so long to give an answer back to the customer? I mean, I did the identity verification on 15.12.2015, no answer so far. The holiday season is usually busy. Hope you got your reply by now. This post helped me as well, but I was also in a similar situation. I just filled “12345” as my old postal code and wrote the correct one in the column for ‘ort’. It worked just fine for me. 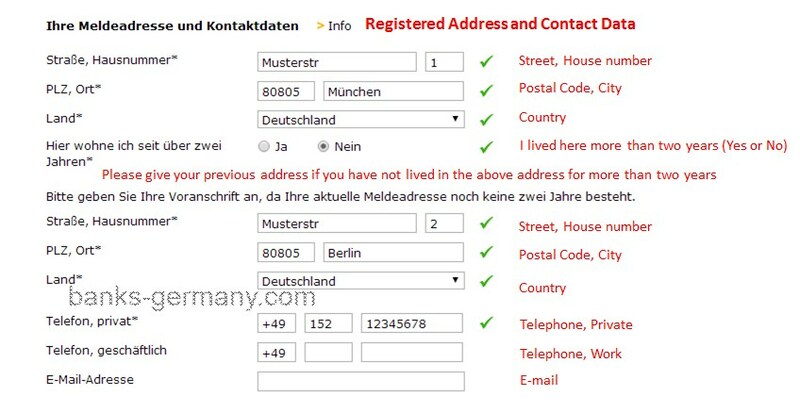 Hi Bert, since the form is designed for German postal code number (5 digits), you cannot add alphabets on them. Dont worry, the previous address is important for previous German residents since the bank checks the credit worthiness of the applicant using your address through the SCHUFA database. If you just moved in from another country, then this is not possible, so they will not do the credit check. As Sai says, just enter normal numbers, it would be fine as it is usually ignored. I am a foreigner with a German passport, but I never lived in Germany. I plan to move in a couple of months. Can I open a bank account without a local address? Do money transfers to/from other countries carry any special rates? Can you please clarify the main differences between number26 and ComDirect apart from the ones listed in the comparison table? I am really not sure which one to select. I just saw that number26 do not offer schufa records which might be problematic when renting an apartment, no? Does comzdirect offer schufa records? I just opened an account with Comdirect, and received the welcome pack and customer number nearly 2 weeks ago. But instead of sending me the PIN number to log in and activate my account, they sent me the PIN number for my girokarte which I don’t receive until my account is activated online! I can’t get any English help on the phone or online, I’m desperate as I need this account activated to give to my employer ASAP!!! I sent them a google-translated email explaining the situation, but still no reply. Sadly both the banks DKB and Comdirect rejected my application although all the provided information were correct. Both the banks have stated that we cannot disclose the reason. Quite perplexed, dont know what to do. Which will be the next option to apply. May be a question, after how many days have spent in Germany one can open a bank account with residence permit ? Although am working and living here. Hi I recently have opened an account with Comdirect. Could you please tell me what is that Tagesgeld PLUS konto which comes with a separate IBAN? My spouse is a German citizen who has been living in the US for thirty years. She does not have current German indenty documents other than her passport. She is part of an estate (erbgemineshaft) and they are selling the family home and splitting the proceeds. 1. Will she actually need a German bank account? 2. How can she get an account without having a current address in Germany? 3. Can the attorney who is settling the estate handle that for her? 4. When she travels to Germany for the closing, can she open an account while she is there?